During summer our hair needs some extra nourishement and protection. The sun, salt, chlorine, wind, hairdryers and brushing can damage our hair. Due to all these factors, hair can become dry, coarse, frizzy, fragile with split ends and a fading colour. Therefore, I always tend to buy a special range of hair products in summertime. 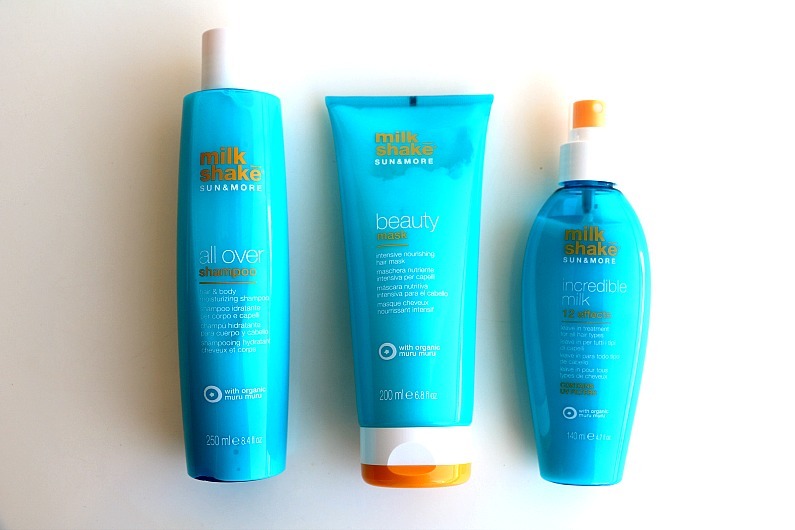 This summer, my choice is Milk_Shake Sun & More line of professional haircare products which includes all over shampoo, beauty mask and incredible milk (a leave-in treatment). 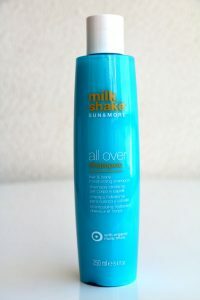 The all over shampoo has a two-in-one cleansing and soothing formula for hair and body. It contains muru muru seed butter, quinoa proteins, hibiscus seed oil, organic argan oil, vitamin E and UV filters. I must admit that I have been using it only as a hair shampoo. It leathers nicely and rinces easily, but it leaves my hair rather stiff to the touch and somehow tangled. I wouldn’t be able to comb it easily if it weren’t for the hair mask which is used after shampooing. The intensive nourishing hair mask combines conditioning ingredients with natural extracts, vitamin E and UV filters to soothe all the damaging effects. It is applied on clean dump hair and left on for 2-3 minutes after which it should be rinced well. The mask leaves hair soft and manageable, fighting the dehydration. 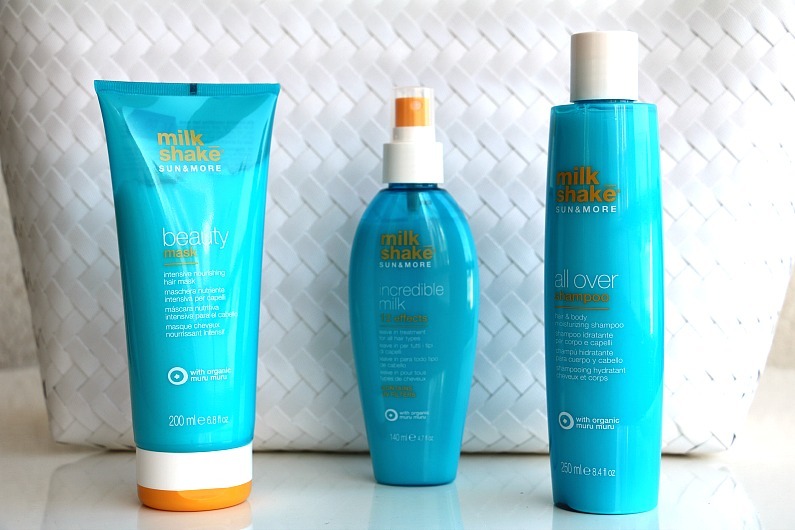 The hero product from the range, in my opinion, is the incredible milk, a leave-in treatment for all hair types. It claims to have 12 incredible effects: it repairs, tames frizz, prevents split ends, protects from heat, gives manageability, detangles, gives incredible shine, gives body and volume, makes styling easier, protects and maintains colour, protects from UV rays and smoothens the cuticle. The treatment is applied on dump hair after you have rinced the shampoo and mask. The milk makes a huge difference (I have also used it with a different shampoo and conditioner and it has had the same effects). 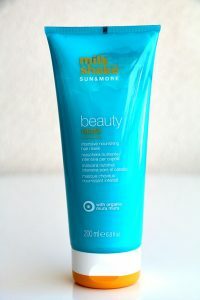 It made my hair look healthier immediately after the first use, giving it incredible shine, smoothness and elasticity. All three products smell great, having some milky scent which reminds you of something edible. 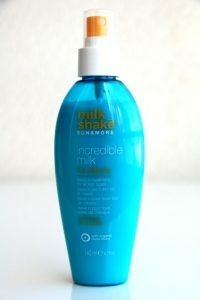 Milk_Shake Sun & More products are available only in professional salons. I have bought mine at the Beverly Hills Beauty Salon in Limassol. A 250ml shampoo costs 15,00 EUR, a 200ml mask sells for 16,00 EUR and a 140ml incredible milk costs 18,00. 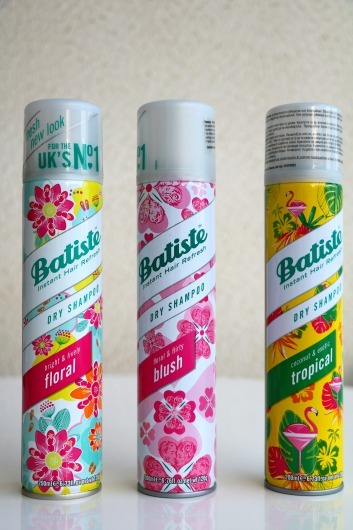 Batiste has been the UK’s No.1 dry shampoo brand for over 30 years. At the heart of this shampoo is an innovative starch based “no water needed” formulation. It claims to banish oily roots, giving dull, lifeless hair the makeover it needs. It refreshes and revitalizes hair, adds body and texture and leaves it feeling clean and fresh. 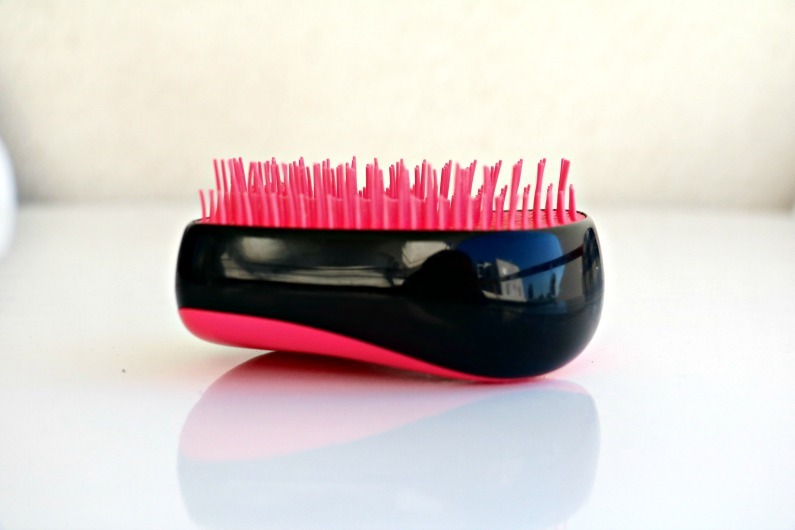 It is meant to be used between washes when you need a fabulous hair fast. It does what it claims! 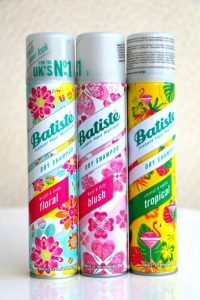 I have been using Batiste dry shampoo for a while and it has become one of my staple products. My hair is extremely fine and straight and it is dry at the ends and oily at the roots even one day after I wash it, so this shampoo comes in very handy. 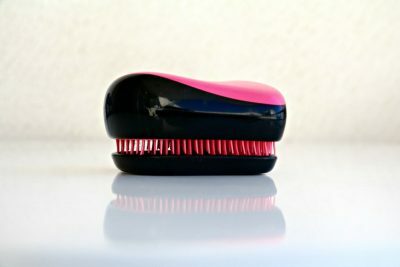 It blends nicely into the hair and although it leaves a bit of white residue, it is not the problem as it disappears quickly and easily when you brush it out. It absorbs the excess oil and leaves the hair feeling clean giving it some texture and a lot of volume. There are different fragrances and all of them have a pleasant smell which is fresh and invigorating. It is not pricey as well. It costs around 5,00 EUR and you can get it at Debenhams, Carrfour and Alphamega supermarkets. This shampoo works perfectly for my fine hair and I really love it.